Banner available for download from Here. This amateur weather station is in the Postcode area of PE16 6AY and came online using the Saratoga template in late December 2013 using high specification equipment from Davis with a Vantage Pro 2 display console, data is collected every 2.5 seconds from the sensors, updating to the internet every 60 seconds on average via Meteobridge Pro hardware. The station comprises of an anemometer, wind vane, heated rain gauge, 24hr fan aspirated thermo-hydro sensor, UV and solar sensors situated in optimal positions for highest accuracy possible. A high definition IP weather camera is used to display current skyline images. Chatteris Weather website is continuously undergoing refinement and additions, at times some pages may be unavailable during upgrades, we thank you for your patience. Please do not base important decisions on the information presented on this site, always check with official sources. BBC Radio Cambridgeshire - Radio interview with yours truly about Chatteris Weather broadcast on the 7th March 2016. Chatteris is a friendly market town situated between Huntingdon, St. Ives, Peterborough, March and Ely, in the middle of The Fens. This is the lowest lying area in the United Kingdom with most of the land surrounding the town being below sea level, although the highest point in the Fens (36 feet above sea level) is within Chatteris's parish boundaries. The peaty land surrounding the town is largely used for agriculture, drained by numerous ditches and dykes, and there are two large drainage rivers near the town - the Forty Foot Drain, also known as Vermuyden's Drain, and the Sixteen Foot Drain. Mentioned in the Domesday Book of 1086, the town has evidence of continuous settlement from the Neolithic period and is locally reputed to have been the last refuge of Boudica as she fled from the Romans. The parish of Chatteris is large, covering 6,099 hectares, and for much of its history was a raised island in the low-lying wetland of the Fens. Following the draining of the Fens, beginning in the 17th century and completed in the 19th century, the town has become a centre of agriculture and related industry. This sites data is freely available to educational establishments, students and other providers of instruction (Guide). Please acknowledge the source if used. 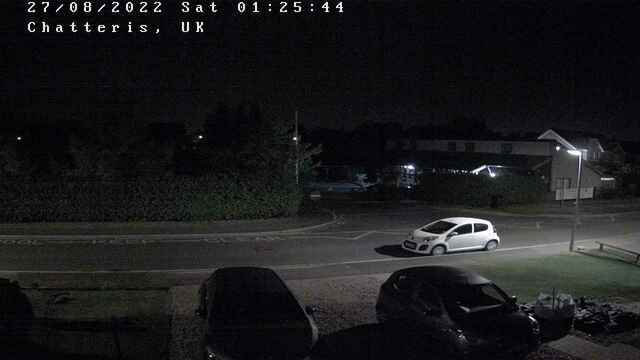 Hikvision DS-2CD2032-1 IP Webcam using cameras embedded server to publish images to Weather Underground via Meteobridge Pro. Special thanks go to Kevin Reed (RIP) at TNET Weather for his work on the original Carterlake templates, and his design for the common website PHP management. Banner picture used with the kind permission of Chatteris Town Council. Special thanks to John Scheuer of Dynamicdrive.com for his valuable help, with an extra special thank you to the members of the weather forums and private weather station operators who have taken the time to answer my questions in order to get Chatteris Weather website functional. A list of links for the scripts used on this site is available here.